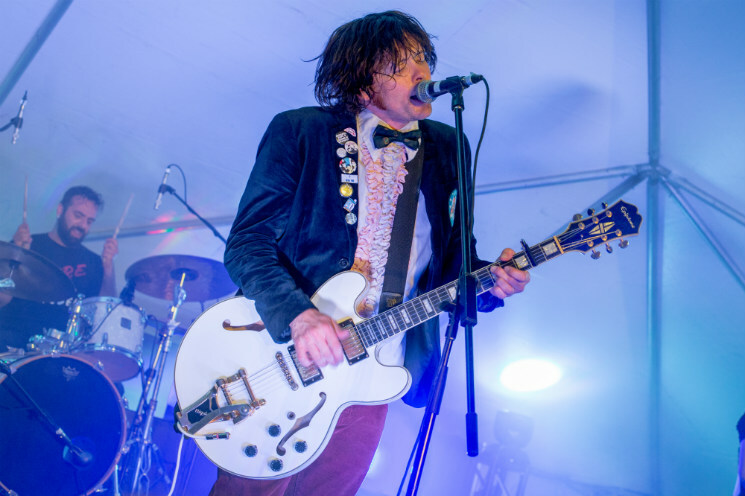 Beach Slang astutely tapped into rock'n'roll nostalgia on last year's debut LP The Things We Do to Find People Who Feel Like Us, proving that as long as kids want to get fucked up at punk shows (and as long as a slightly older crowd longs for their youth), there's no danger in the rock'n'roll dream dying. Despite recent onstage spats and the ultimately amicable resignation of drummer JP Flexner last week, the band's shaky live reputation only made the atmosphere in the lead-up to their Gridlock show more exciting. Despite the air buzzing with unpredictability, James Alex and the gang arrived promptly and professionally, the frontman dressed to the nines in cords, a button-bedazzled blazer, bowtie and ruffled pink shirt (which, yes, he did "pick up at a thrift store for 75¢"). Exuding visceral energy from the opening chords of kick-off "Throwaways," everyone on stage was in fine form, though Alex inevitably stole the spotlight with his endearingly "raspy cackle," windmill moves and genuine expressions of gratitude to the fans (at one point even stopping to hug a fan and sign her LP). Blasting through the likes of "Filthy Luck," "Get Lost" and "Hard Luck Kid," the group recharged between songs with chugs of boozed-up orange juice, Alex eventually pausing to giggle and proudly announce: "I'm drunk." From there, the four-piece served up a couple more highlights with "Noisy Heaven" and "American Girls and French Kisses" before Alex gave "Too Late to Die Young" a whirl solo. That glorious rendition resulted in a broken guitar string, though, which sent the set spiralling a bit — as a replacement guitar was sought out, guitarist Ruben Gallego entertained the crowd with party trick-esque classic rock riffs. Those nearly devolved into a full-blown cover version of Blue Oyster Cult's "Don't Fear the Reaper" (and chants for "More cowbell! "), but the night's most memorable moment was still to follow. As the crew was frantically trying to remedy the broken string situation, a pair of fans hopped up out of the crowd and onstage, leading Alex and everyone in attendance in raucous rendition of the Replacements' "Can't Hardly Wait." Just in time, Beach Slang reined some semblance of structure back in, returning to their four-man lineup and triumphantly closing out the set with "Punk or Lust." It was the perfect ending to a beautifully chaotic punk rock shitshow.